Though some might say this is a bit too simplistic and relying heavily on the trusted 909, this is a solid no-bullsh*t dj-record with a generally upbeat mid 90s techno mood throughout. Worth checking. 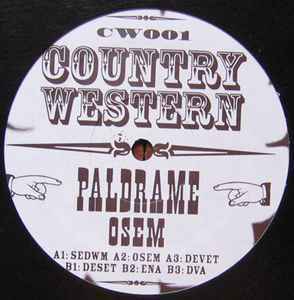 This record, while very possibly (or obviously) recorded in Europe, was released by "Head in the Clouds", a sub-Labels of DJ ESP's (Woody Mcbride's) Communique records. A fine record definitely, especialy due to the hard distorted handclaps and cymbals through a flange effect. All this while the kick drum and bassline lie very comfortably in the background.,,, (probably compressed to hell). Communique came out of Minneapolis, Minnesota, USA, and was home to many excellent electronic musicians such as Paul Birken (Bobaflux) for a long time in the mid to late 90's. I found this record as a test pressing with "CW001" written on the label, and the corredponing tracks etched in the vinyl just outside the label. I remember DJ Nigel Richards playing tracks off of this release alot in the mid-nineties whenever he plyed in Minneapolis. Good record.